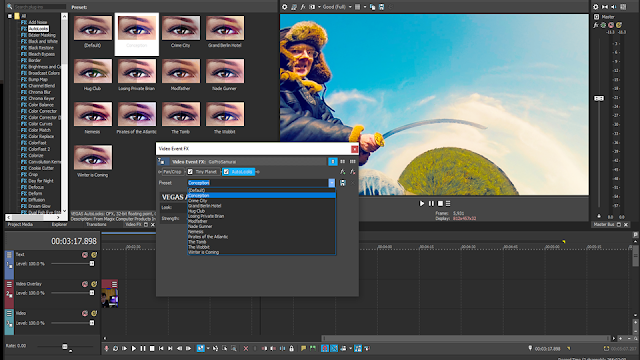 VEGAS is a powerful video editing package which has been given a new lease of life since its acquisition by MAGIX Software in 2016. In fact, VEGAS 16 is the third major release in just two years. New features include improved video stabilization and motion tracking, 360-degree video support (assuming you have a suitable 360-degree camera! 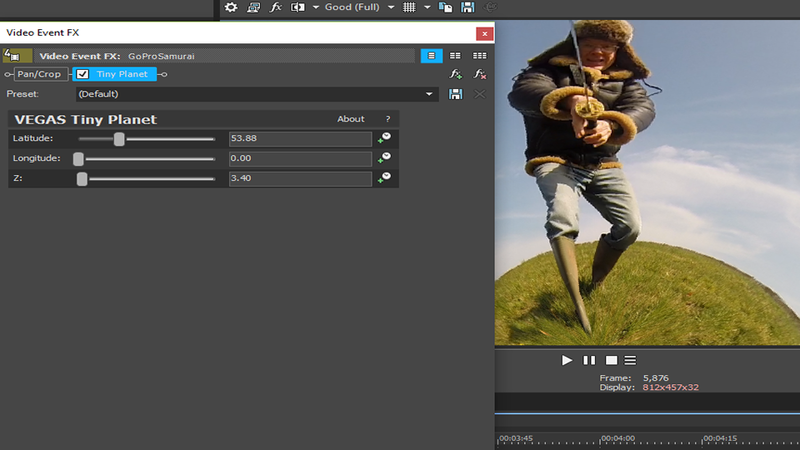 ), a ‘tiny planet’ plugin that distorts a video using an extreme fisheye effect to make it appear that the ground-plane forms a planet-like sphere, plus various user interface improvements. Using 'tiny planet' I've transformed an ordinary field into a little world! Plugins and effects can be ‘chained together’ by adding one plugin after another. The advantage of this approach is that you can selectively tweak numerous different parameters for each effect to give you precise and accurate control over each of them. The disadvantage is that this process can be time-consuming and confusing. For example, it may be entirely possible to remove background noise from a track using the Audio Restoration and NoiseGate effects (plus others) but working out how to do so can be baffling. Personally, I find it simpler to process audio tracks using some other tool such as the free Audacity audio editor or MAGIX’s own SoundForge program. Video Effects can be similarly non-obvious. 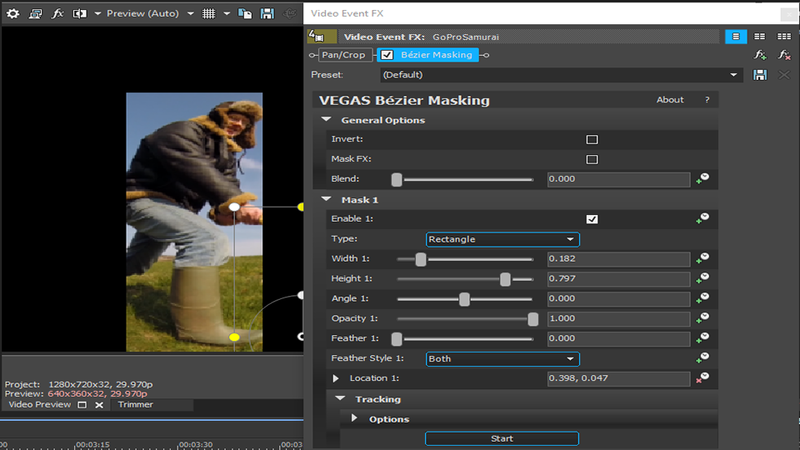 For example, to apply Motion Tracking you need to use a tool called ‘Bezier Masking’, then draw out a selection box over an object, expand a ‘Mask’ option in a dialog and finally click a button to track the object. If I hadn’t seen the MAGIX tutorial on this, I can honestly say I’d never have guessed that this was how to do it. The newly enhanced Motion Tracking feature includes the ability to select objects (such as a person or vehicle) and automatically track their motion as the video plays. Masks and effects (blurs, contrast/brightness and so on) or text annotations can be added to the tracked objects to follow their movements. A very useful tool. It’s worth saying that VEGAS has pretty much all the features you would expect from a pro-level video editing package: the ability to cut, trim, copy and move clips over numerous tracks in the timeline; a large range of transitions and effects; zoom, pan, add titles and so on. 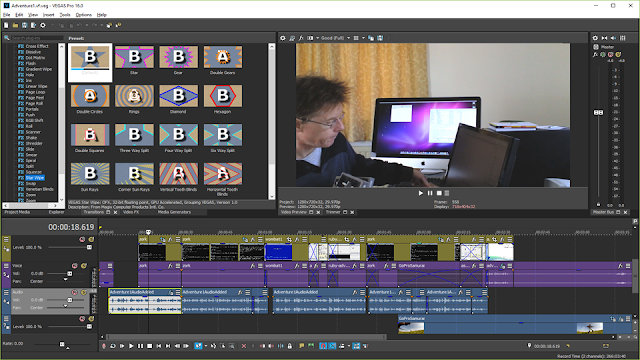 For a more detailed overview of the code features of VEGAS, see my reviews of VEGAS Pro 15 and VEGAS Pro Edit 14. For those of you who use storyboards (a view of clips arranged either as lists or as sets of thumbnails arranged in lines like the rows of a spreadsheet) the new interactive storyboarding options will no doubt be welcome. This lets you make edits to the storyboard clips (e.g. changing the start and end points) or in the timeline (e.g. moving a clip to a new position) and the changes are synchronized in both the storyboard and timeline. If you want to change the colour temperatures and densities to emulate some Hollywood films, you can use the new Autolooks filter. The names of the preset options (‘Losing Private Brian’, ‘Nade Gunner’, ‘The Wobbit’ etc. may give you a few clues as to the sort of look these try to achieve). Overall this is a good new release of VEGAS Pro. It incorporates a range of useful improvements without sacrificing the familiar workflow of previous releases. Bear in mind, however, that while VEGAS is a powerful package, it is not the easiest video editor for a complete newcomer. But for serious video editing at a modest price, VEGAS Pro 16 is a damn’ good choice. NOTE: Vegas Pro 16 is available in several editions which include additional features, at higher prices. See the product comparison table here: https://www.vegascreativesoftware.com/gb/vegas-pro/product-comparison/#productMenu For my reviews of other video editing packages, see HERE.